The table of contents provides a thorough breakdown of what to expect in the book. Discover Science Insects begins by covering what an insect is, insect senses, insect hunters, life cycles, and much more. Each page has close-up pictures of the insects discussed along with good, detailed explanations. Even some of the insect mouth parts—that are very rarely seen without a microscope because of their extremely small size—are pictured and discussed, creating a good understanding of the function of these parts and how the insects use them in different ways to get what they need to eat. The book covers various types of insects including ones that fly, live on plants or land, live on humans or animals, and ones that live in or use the water. There is a broad range for the interested reader to learn about. At the end of the book are lots of great features that parents and teachers will find useful and beneficial. The first part is a craft section that teaches children how to study the insects in their own backyard, how to create a butterfly, and how to make insect models and mobiles. There is a section that includes a glossary featuring the terms used throughout the book. Another section includes a note for parents and teachers. This section is to help teach and reinforce various elements of the science and language arts curricula. It also provides cross curricular lessons in geography, art, and math. This is superb for a teacher in a regular school or home school setting. It offers a lot of great ideas that will get children thinking about the information and applying it at the same time. An added element is an insect quiz that maximizes reading comprehension with chances to refer back to the text for the answers. At the end of the book there is also a further research section informing the reader of other books, websites, or places to visit to learn more. 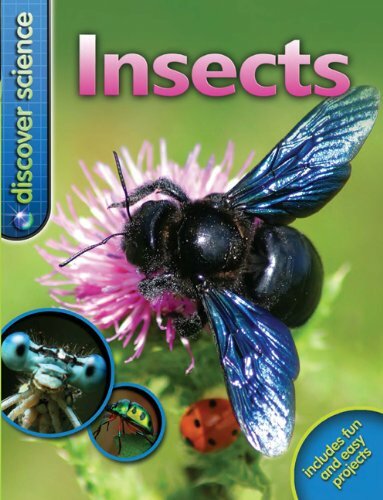 Overall, this book is an excellent source for children to learn about insects. It briefly covers enough information to interest the reader and getting them into wanting to learn more about these underrated—and often dismissed as disgusting—creatures, which, as this book proves, are really very interesting.